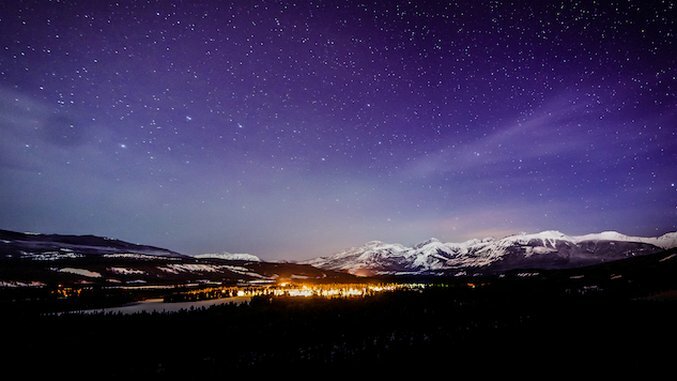 Far from the light pollution found in bigger cities, the stars come out bright and big in Jasper National Park. On a clear night, simply look up and let your eyes adjust to the dark—you’ll likely see more stars here than anywhere else you’ve been. In fact, the sky is so dark that in 2011 the Royal Astronomical Society of Canada designated Jasper National Park a Dark Sky Preserve. Stargazing is so spectacular within the park that it hosts the Jasper Dark Sky Festival each October, when the daylight hours begin to dwindle, which makes all of winter a great time for stargazing. Sure, TLC urges listeners, “Don’t go chasing waterfalls …” but that’s just what you’ll want to do while in Jasper—frozen waterfalls, anyway. Outfitters such as Rockaboo Mountain Adventures take not-faint-of-heart adventure seekers to frozen waterfalls found throughout the area for instruction and climbing. One of the most well-known and gorgeous canyons for ice climbing within Jasper National Park is Maligne Canyon (pictured), where there are as many photo opps of the canyon itself as there are of you making your way up a frozen waterfall. Clip on a set of crampons, grab a few picks, belay on, and you’re ready to climb. With the highest base elevation in all of Canada, Marmot Basin’s skiing and snowboarding seasons runs well into April, leaving plenty of time to make tracks this season in Jasper National Park. A quick 20-minute drive or shuttle ride from “downtown” Jasper delivers you to the base of the mountain with 3,000 vertical feet and 1,675 acres of varied terrain waiting to be conquered. No skis? No problem! Rent your equipment on the mountain to avoid lugging it all with you on the planes, trains and automobiles it will take you to get to Jasper. Combine the bluebird skies with dry fluffy snow and you have idyllic conditions seemingly all to yourself. The Icefields Parkway,named one of the top 10 scenic drives in the world by too many sources to list here, runs 144 miles and connects Banff to Jasper, but you don’t have to go all that way to see some stellar sites. Rather, take your time and pull the car over when inspiration strikes—there are plenty of hiking trails and photo opps of mountains, glaciers, alpine meadows and lakes along the way. One stop you have to make is at Athabasca Falls (pictured), where water thunders through the canyon’s frozen walls, making it one of the most dramatic spots in the park. After days on the go, take some time to relax, unwind and sooth aching muscles. The hottest hot springs in all of the Canadian Rockies are found at Miette Hot Springs (pictured), where the water flows in from the mountain at 129° F and is cooled to a more reasonable 104° F for soaking in the hot springs pool. Sit back, melt into the water and take in the panoramic views of the peaks around you. For even more relaxing, make reservations at the Fairmont Jasper Park Lodge on the outskirts of town. The iconic lodge has been welcoming guests to its luxurious surroundings for 100 years, and is the perfect place to relax and restore in your own cabin-like room before venturing back out into the wonders of Jasper National Park for another fun-filled day. Let’s address this first thing: getting to the town of Jasper in the heart of majestic Jasper National Park in Alberta, Canada isn’t easy by any means. After flying into Calgary or Edmonton, you have three options to get to Jasper: bus, car, or train. By bus or by car, you’re looking at a three- to five-hour drive (depending on weather conditions and departure point) to Jasper. By train, Edmonton’s your only option; count on a five and a half-hour ride. What may indeed be a very long day of travel will deliver incredible results, however, when you first lay eyes on Canada’s largest park in the Canadian Rocky Mountains. Here, a few ideas on how to spend your time in Jasper during these last weeks of winter. Susan B. Barnes is a beach girl at heart who’s recently discovered her love of snowy wintertime fun.